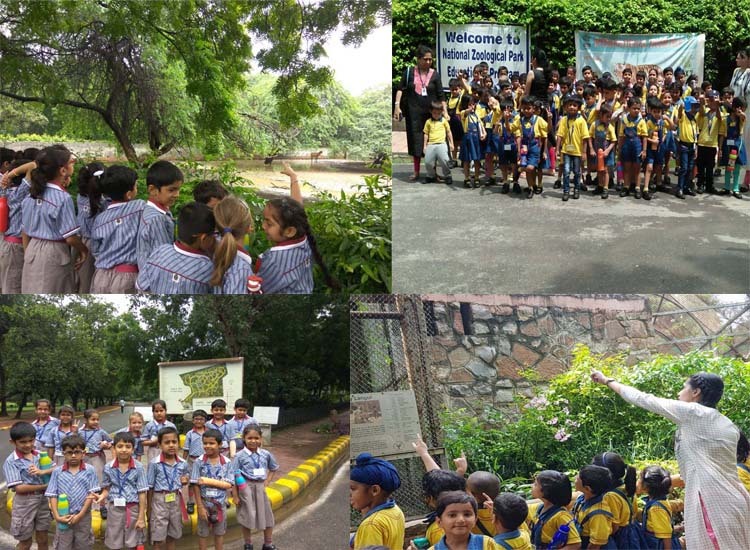 A trip to the National Zoological Park was organized for the students of Nursery to class II on 23rd of August 2018. The Delhi Zoo is home to several mammals, birds, reptiles and other species in a diverse natural habitat. The day was cloudy and sunny making it perfect for walking around the zoo. The students enthusiastically observed an array of animals and birds as their teachers pointed out their special characteristics. They saw some familiar and unfamiliar species of animals and birds– the Asiatic Lion, White Tiger, Bengal Tiger, leopard, African Elephant, jaguar, Black Swan, migratory birds, etc. The students were curious to know more about the animals and there was a seemingly unending stream of questions from the inquiring bunch! The teachers patiently pointed out interesting features about each animal, thus helping them stretch their little ‘banks of information’ on animals. The students were very excited to see animals and birds ‘for real’ in their natural habitat as compared with looking at them in their picture books and on television.